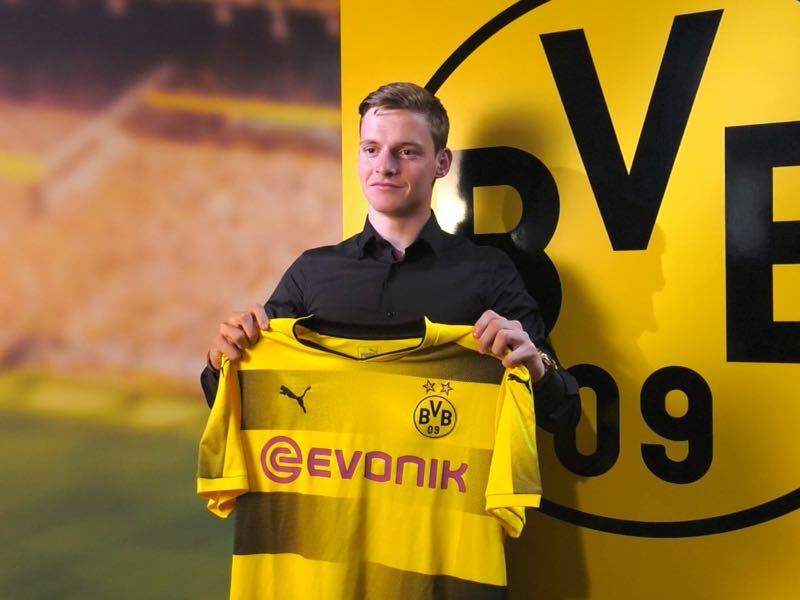 Borussia Dortmund have done it once again and signed one of Europe’s brightest prospects in Barcelona forward Sergio Gomez. The deal comes amidst a complicated transfer window for the club that will likely see Pierre-Emerick Aubameyang leave for Arsenal. It has to be quickly pointed out that Sergio Gomez will not be Aubameyang’s replacement. Although immensely talented the 17-year-old forward will be another player for Borussia Dortmund’s future. Joining the likes of Alexander Isak, Jadon Sancho, Christian Pulisic and Dan-Axel Zagadou in a long list of prospects that are in various stages of their development without being an end product. There is, however, no doubt that this list is supreme and might indeed provide the biggest collection of world-class talent at one club in Europe at the moment. 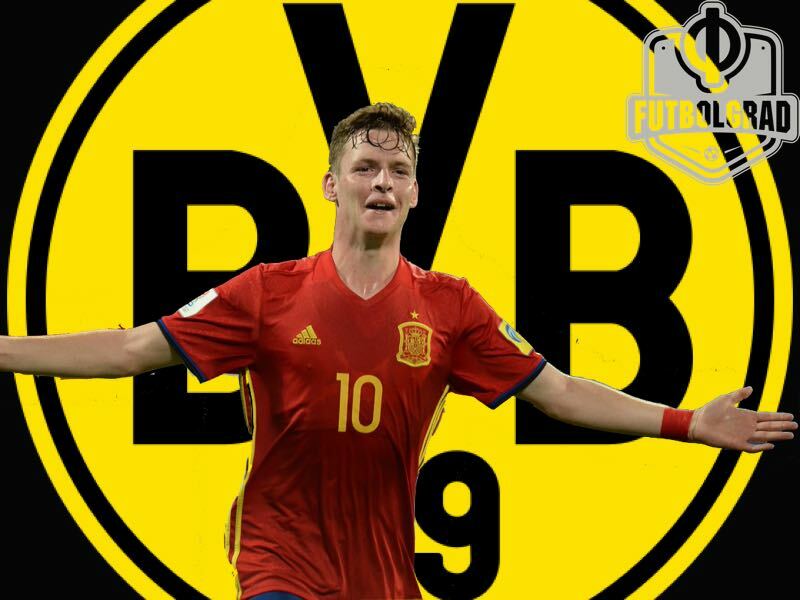 Upon his presentation on Tuesday BVB sporting director Michael Zorc labelled Sergio Gomez as one of the “worldwide best players of his generation. We have been interested in him for quite some time and are happy that despite offers from other European top clubs he decided to join Borussia Dortmund. Zorc was, however, also clear that Sergio Gomez will not be an option for now. Instead, he will be training with the first team while playing with Dortmund’ U-19 side until the summer. A product of Barcelona’s La Masia academy Sergio Gomez will join Borussia Dortmund for €3 million and has signed a long-term contract. Who is Sergio Gomez and do Dortmund need him? The question that many BVB fans will ask, however, is who is the forward and is this the right time to sign another prospect? The first part of the question is easy to answer. Sergio Gomez was one of the standout players at the U-17 European Championships last spring and then once again at the U-17 FIFA World Cup in October. Spain ended up winning the U-17 European Championships with Sergio Gomez scoring three goals in six matches. His country was somewhat less successful at the U-17 World Cup in India where Spain reached the final, but where defeated 5-2 by England. Gomez, however, managed to score both goals for Spain in that game capping up the tournament with four goals in seven games. Pretty decent numbers for a player, who is at home on the left-wing and not in the centre of the pitch. Sergio Gomez, in fact, is a classical winger and not an all and out striker. He, therefore, fits into the same sort of category than Jadon Sancho and Christian Pulisic providing Borussia Dortmund with even more depth on both wings. Watching scouting videos of the player the first thing that becomes immediately obvious is his set-pieces technique—most videos, in fact, seem to highlight that he has scored directly from corners on several occasions. This Mario Basler—Gomez’s freekicks are also unbelievable—sort of ability is, of course, a rarity in the game, but Sergio Gomez should not be limited to his set-piece ability alone, and I am sure neither did Borussia Dortmund scouts. Instead, it is his first touch on the ball, as well as his ability to score with one touch shots. His shooting technique might look a little odd but seems to make it impossible for keepers to guess where the ball goes as the shot almost seems to go up and drop right away after leaving his boot. Another aspect is his ability to read situations well in tight marked areas. He almost always makes the right decision after receiving the ball in tight areas in front of the goal, which can make him a dangerous weapon when playing against deep defensive formations. Will his game translate to the senior level? The question, however, is how his game will translate from the junior level to the men’s level? Not the shortest player, he is 178cm tall, he already appears old enough to make the step now—given Andriy Yarmolenko’s recent injury and questions over Marco Reus’ fitness that might very well be the case at some point soon. This, of course, brings us to the second question do Dortmund need another young talent? Given today’s’ player market you can of course never have enough talent in your ranks. Also, keep in mind Sergio Gomez will be given time to develop, and more experienced players will come in once the Pierre-Emerick Aubameyang transfer away from the club is concluded.